Summary: "For seventeen years, Eloise Hart had no idea the world of Faery even existed. Now she has been abducted and trapped in the Rath of Lord Strahan, King of Faery. Strahan was only meant to rule for seven years, as Faery tradition dictates, and then give up his crown to another. But he won't comply, and now chaos threatens both worlds. The only one who can break his stranglehold on the Faery court is his wife. . . Eloise's aunt Antonia. Using Eloise to lure Antonia, Strahan captures his wife, desperate to end the only threat to his reign. Now Eloise must become the rescuer. Together with her best friends Jo and Devin, she must forge alliances with other Fae, including a gorgeous protector named Lucas, and Strahan's mysterious son, Eldric-who may or may not betray them." Thoughts: I don't know how Alyxandra Harvey does it, but yet again she has written another adventurous and addicting novel. I just couldn't put it down! From the enticing characters to the nonstop action and even the humorous dialogue, Stolen Away simply stole me away. The story is written from two separate points of view. First off, you have Eloise. Her story is interesting in the sense that her Aunt Antonia is not only human but also the wife of the fey king, Strahan. In this story, the fey king only rules for 7 years before passing on the crown. Not Strahan. He wants to rule forever and Antonia is the only one who can stop him. With that said, Eloise doesn't even know faeries exists. At least, not until she meets the handsome and charming Lucas. He may dress a little funny, but he sure can take Eloise's breath away. It turns out Lucas is Eloise's protector and after Eloise's aunt is captured, they must travel to Faerie and rescue her. What I love about Eloise is that even though she knows the dangers that await her in Faery, it doesn't stop her from wanting to rescue her aunt and save her friends. She's probably the most gentle out of all the characters, but can still be tough when she needs to be. My personal favorite character, though, has to be Jo. The other half of the story is told through her point of view, and let's just say she's wild like a firecracker! I loved her witty and snarky comments. She had be bursting out laughing on several different occasions. Plus, I think I also enjoyed her romantic relationship more than I did with Eloise and Lucas. Jo and said character (sorry, no spoilers!) just had more passion between the two of them. Where Eloise and Lucas were sweet, Jo and said character were hot. To me, the spicier it is, the more I love it (this applies to food and books!). 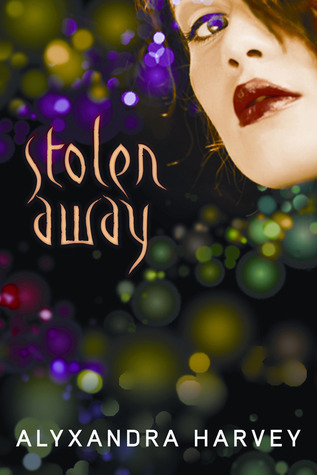 Overall, Stolen Away is an interesting take on the Faery realm. It offers readers two separate boys to fall in love with and two heroines to cheer for. Double the pleasure, double the fun, right? I would highly recommend this to fans of Julie Kagawa's Iron Fey series and Harvey's Drake Chronicles. Ooh I love dual POVs and this sounds pretty good considering I don't always like Fae stories - I've had a few bad experiences haha. I'll def. give this one a try though sounds like a good one! @Rachel- I havqe read Aprilynne Pike's Wings series! Can't wait to see how the final book turns out. @Karen- I think it's a standalone, but I guess it could be a series if the author decides to make it one. I think I would really enjoy reading Jo's POV. I haven't read any of Alyxandra's books before, but you've put her on my radar!